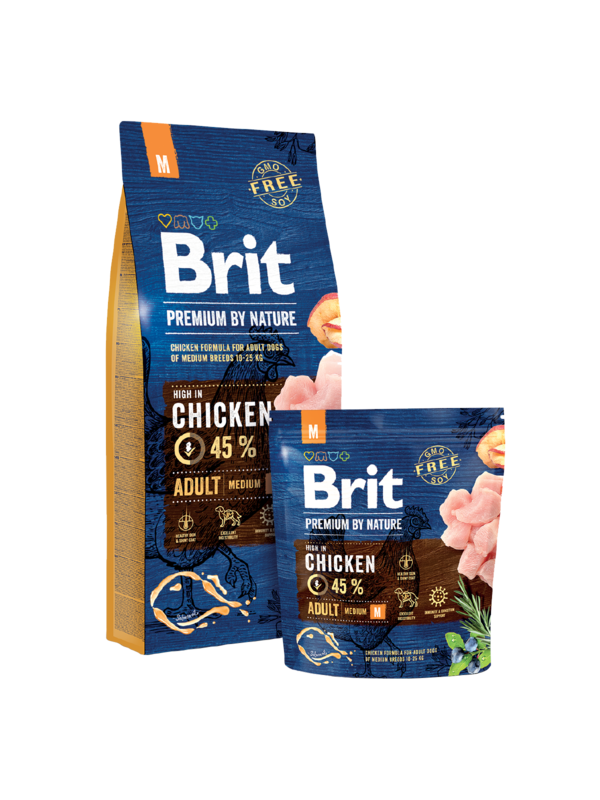 Complete Chicken Formula for Adult Dogs of Medium Breeds (10-25 kg). Composition: chicken 45% (dehydrated 25%, deboned 20%), oats, wheat, chicken fat (preserved with mixed tocopherols), corn, apples dried, salmon oil (2%), hydrolyzed chicken liver, brewer´s yeast, collagen, crustacean shells (a source of glucosamine, 210 mg/kg), extract (a source of chondroitin, 150 mg/kg), herbs & fruit (cloves, citrus, rosemary, curcuma, 120 mg/kg), mannan-oligosaccharides (120 mg/kg), fructooligosaccharides (90 mg/kg), Mojave yucca (90 mg/kg), chamomile dried (80 mg/kg), green-lipped mussels (a source of glycosaminoglycans, 50 mg/kg), blueberries dried (50 mg/kg). Analytical ingredients: crude protein 26.0 %, fat content 15.0 %, moisture 10.0 %, crude ash 7.0 %, crude fibre 2.2 %, calcium 1.5 %, phosphorus 1.1 %, omega 3 0.2 %, omega 6 1.7 %. Nutritional composition: vitamin A (3a672a) 15 000 IU, vitamin D3 (E671) 1 000 IU, vitamin E (α-tocopherol) (3a700) 400 mg, biotin (3a880) 0.5 mg, choline chloride (3a890) 500 mg, zinc chelate of amino acids hydrate (3b606) 70 mg, ferrous chelate of amino acids hydrate (E1) 60 mg, manganese chelate of amino acids hydrate (E5) 30 mg, potassium iodide (3b201) 0.5 mg, cupric chelate of amino acids hydrate (E4) 12 mg, organic form of Selenium produced by Saccaromyces cerevisiae CNCM I-3060 (selenised yeast inactivated) (3b8.10) 0.2 mg.